If you are interested in Birding Paris Avignon Arles and the Camargue France, come and join us at Kaiyote Tours! Paris is one of the art centers of the world. Not just for the collections that the museums hold, but for the inspiration is still gives to artists today. We start and end this tour in Paris, such an amazing city to see. 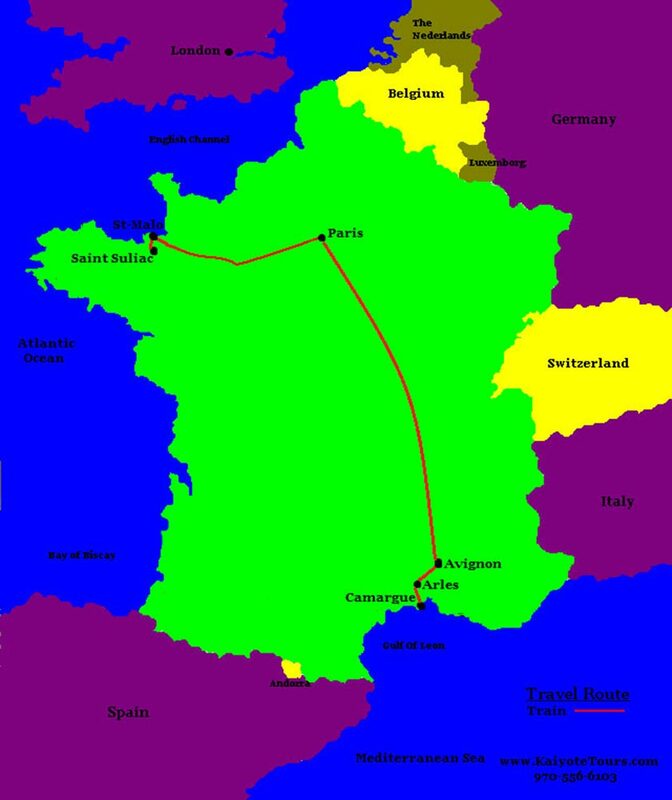 We will be taking the train to the Rhone River Delta area known as the Camargue and spend 5 days visiting two historically significant towns: Avignon, Arles and Saintes Maries de la mer. Where a better place to enjoy the Mediterranean, but in the south of France? Voila!! You will enjoy this tour if you only wish to see Paris, the Rhone River Delta (the Camargue), the Mediterranean, the cities of Avignon and Arles and Saintes Maries de la mer and walk the land and enjoy the sights. Each day there will be time for birding, walking, exploring and learning. Rates include: Domestic transfers, lodging, breakfast, lunch, dinner, scheduled group tours, entrance fees and Allianz travel medical insurance. Not included: International airfare, customs & immigration fees and visas, alcohol, trip cancellation insurance. Flights from the states are over-night and your arrival should be on day one at the Charles de Gaulle International Airport (CDG). You will be met at the airport and shuttled to the hotel. Activities for the day will depend on your arrival time. On this tour there will be three days in Paris. If you are most interested in Birding: There is the Bois de Boulogne, which is a 2,100-acre park with woods and gardens just on the western edge of Paris. We will have time to walk down the Champs Élysées and see the Arc de Triomphe. In the afternoon we can visit Pére Lachaise Cemetery; besides being the resting place for numerous great artists, writers and composers including Frédéric Chopin, Molière, Eugène Delacroix, Camille Pissarro, Oscar Wilde and Jim Morrison, it is an excellent place to see birds and interesting sites. If you are most interested in Art: There are so many museums and sights in Paris, it could never be accomplished in three days, but let us know your priorities and we will make it happen. In the late afternoon and evening, we will visit La Basilique du Sacré Coeur and the Eiffel Tower. From Paris it is a 3.5-hour train ride to the city of Avignon on the TGV. The TGV (pronounced tay-zsah-vay) is one of the fastest trains in the world and can travel over 200 miles an hour. There numerous historical sites to see in Avignon including the Saint-Benezet Bridge which was built in the in the 12th century. We will be staying at the Hôtel de Blauvac in the heart of the old town. The Hotel de Blauvac originally belonged to the Marquis Jean-Baptiste de Tonduty, Seigneur de Blauvac beginning in 1664. From Avignon, it is a 30-minute train ride and a 1-hour bus ride to the seaside village of Saintes Maries de la Mer. We will be staying at the Hôtel le Castelet, which is perfectly located at the edge of the Camargue and the Mediterranean Sea. The Camargue is the delta of the River Rhone and covers 190,000 acres. It is a birding paradise and over 400 different species having been identified. The most representative species of the delta is the Pink Flamingo because the Camargue is the breeding grounds for this species. The scenery is beautiful. The Camargue is also famous for the horses that breed here. Today you will have options for activities: Birding, Horseback riding, hiking and cycling. The village of Saintes Maries de la mer is wonderful place to enjoy the Mediterranean Sea and there will be swimming and boating options as well. It is a 4-hour train ride back to Paris on the TGV train. We will have time in the afternoon to visit the Rodin Museum, Musee de l’Armee des Invalides and birding locations of your choice. Our last full day in Paris. Options: There are many museums to choose from such as the Louvre and the D’Orsay, if you have not already visited these locations earlier in the trip. Our recommendation is a full day visiting Versailles, one of the most spectacular palaces in the world. Here you will find spectacular art and design and beautiful gardens for birding. Flights usually leave in the morning, so getting to the airport and getting home is our only activity for the day. Please note: The lodging described in this itinerary is always our first choice based on availability. Details of this trip are a little vague as it is VERY flexible. Destinations throughout the trip are based on the desires, ability and goals of the group.